Antiques are about stories... our stories. Silent records of the past, revealing their secrets through careful interpretation of shape, material, provenence and patina. Most objects lose their provenence, until we own them and begin a new chapter. It's exciting to know anything beyond the basics of date, style, and origin. Here is a fun story about a pair of candlesticks Bob Jorgensen owned 20 years ago. The gentle English rain drizzled down, occasionally drifting with slight gusts. An old man swept the dusty floor, moving around boxes of trash on the ground floor. As he climbed the stairs he grumbled, “Thirty quid to muck out the old house. It’s worth fifty it is. Tighter ‘n bark on a tree, he is.” The second floor wasn’t so bad. He removed all the boxes and junk, and started to sweep the floor, when something caught his eye in a small space behind the chimney. Reaching in behind he removed a dirty pair of heavy objects. In his tired hands were an unusual looking pair of candlesticks covered with peat smoke and creosote from the years of hiding in a smoky attic. The bottoms, however, were brilliant gold. 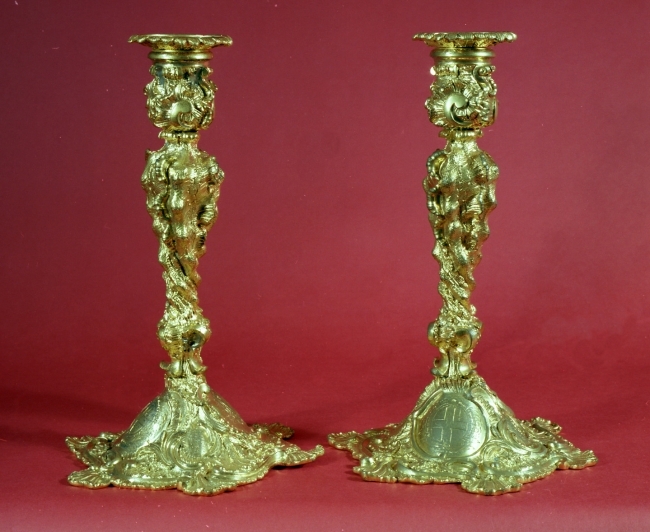 The candlesticks were identified as English Rococo made in the mid 18th century. The 11” high brass candlesticks are hollow core, cast in three sections, joined together with a split base with separate cast bobeches, cleaned and refined with chisels, all fire gilded with gold and mercury. Decorated with a wealth of foliate and scrolls, including coats of arms, presentation inscription, and a date! English Rococo candlesticks are a rare breed. The Victoria and Albert museum had no example, and the trail led to the London Guild Hall, the home of the Worshipful Company of Armourers and Brasiers. Four pair of eighteenth century English Rococo Ormolu brass candlesticks were presented to the Worshipful Company of Armourers and Brasiers by the retiring Worshipful Master Mr. Jon White in 1757. In the companies court minute book found in the Guild Hall Library, it is recorded that on February 15, 1757, Mr. Jon White was thanked “For his present of four pair of candlesticks for the Court Room”. In 1838, when the Guild Hall was remodeling, the four pair were stored in the basement. When they were placed again on display, Lo and Behold, one pair was missing! So, to this day, one of the four pair is replaced and visibly inferior. 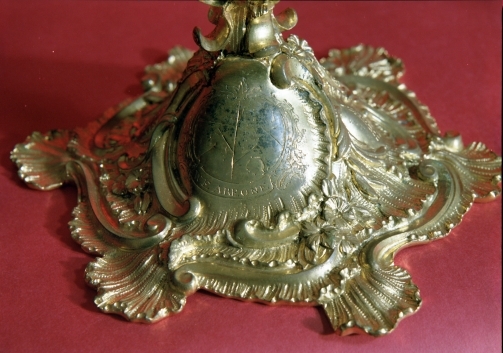 All four pair are engraved on four facets at the base with the Coat of Arms of the City of London, and on the opposite side, the unified Coat of arms of the Armourers and Brasiers company with the inscription, “We are one”. The inscription “We are one” was, and is, the motto of this organization. On the other two facets is engraved, “The gift of Mr. Jon White Master 1757” and on the opposite facet “Wm. Eastwood, William Shemeld wardens”.The four pair were marked with a chisel under the base in Roman numbers, 1-V111. Three of the four pairs in the Guild Hall are marked 111-V111. Guess where numbers 1 and 11 were found—and so marked! The Guild of St. George of the Armourers was instituted on January 5, 1322. In 1708, it was unified with the Brasiers company and is in existence to this date on its original location in the City of London. The Guild began in the reign of King Edward II (1284-1327) by the ordinance of the City of London. On May 8 1453, the Company received its first Royal Charter of Incorporation from King Henry VI (1422-1461) who was a brother of the fraternity. Queen Elizabeth I (1558-1603) granted another charter and King James I (1603-1625) granted the third charter. Both kings granted the Guild Company control of all those who made brass and copper articles, edged tools, guns, and armour. One top metals dealer from NYC who viewed them in our shop stated, “I am now holding in my hand the most important pair of English candlesticks now in this country”. Can you imagine the thoughts in 1838 that existed when the Guild Hall realized that a pair was lost? Their consternation was so acute that they had a pair reproduced! Who hid them in a tiny cottage? Did someone know where they were and died keeping his secret? These juicy details are now lost to history, and all would be unknown had the old man not looked behind the chimney.